Apple’s slumping sales growth in China re-energized discussions on the commoditization of smart phones: the basic idea is that once devices, services, goods, platforms, etc. are interchangeable and can be produced/generated anywhere, they are effectively commodities and their value declines accordingly. In the case of Apple’s iPhone, many observers see diminishing returns on the latest model’s features as the price point (around $1,000) now exceeds what many customers are willing to pay for the status of owning an Apple product and the declining differentiation of the iPhone when compared to other smart phones available at a fraction of the iPhone’s price. Commoditization doesn’t just affect the top tier of the food chain; it affects the entire food chain. The commodity $400 smart phone has diminishing returns over the commodity $200 smart phone, and the $200 smart phone has diminishing returns over the commodity $100 smart phone. Commoditization doesn’t just affect tech devices: passive index funds have commoditized investing. Why pay a hedge fund’s steep fees when a passive index fund may beat the net return (i.e. after fees) of the hedge fund? 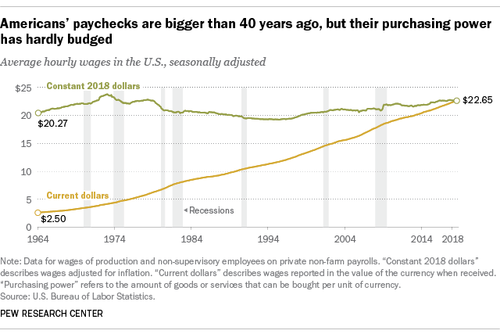 If we consider the digitization powering the 4th Industrial Revolution and the rising political demands for renewed anti-trust scrutiny of monopolistic behemoths, it’s not difficult to discern a continuation of the deflationary trends of commoditization and stagnant wages.